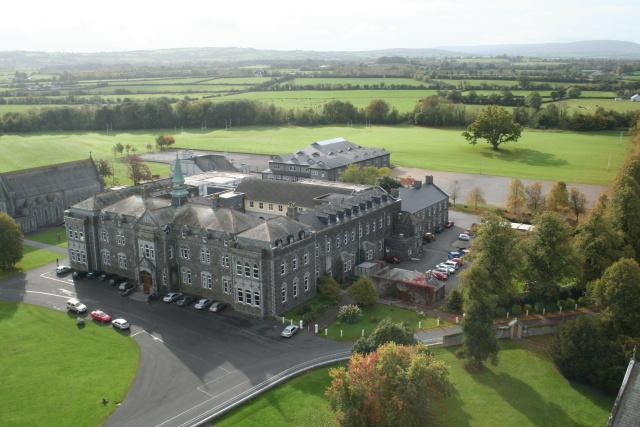 Digging back into memories from over 40 years ago I try to recall some stories and events from my time in Cistercian College Roscrea. It was just five out of the 57 years of my life, but CCR definitely left an impression on me. I have spent my entire career in education, and a lot of what formed me as a person came from this school. While I had some good times there, there were also some not-so-good times too. Below are a few that come immediately to my mind. Image source: Frank C Murray Construction. I don't know what the food is like in CCR nowadays, but in the 1970s it was dreadful. First, imagine 300 growing hungry teenagers all coming for dinner at the same time - it must have been near impossible to prepare this many dinners, never mind make them tasty and nutritious. I think all of us were hungry (not starving) all the time. A Tuck Shop stocked with Mars Bars, and food from home helped keep us going. My most miserable moment with food was once taking a cold roast potato from a plate of collected left-over waste food from a clean-up trolley long after dinner was over - I was so hungry I ate someone else's leftovers. Not all food was bad - the bread keep us alive. It was baked in the Monastery and there was usually plenty of it. Brown or white - the bread was famous, my Dad always made sure to bring some loaves home. It was one of the few things that I looked forward to at meal time. Despite having plenty of bread, there was never enough butter. It was divided up between all the boys on each table. At the beginning of teatime, it was the job of one boy to mark out with a knife portions of butter for everyone - all we got was a square of butter about the size of a sugar cube. Woe betide any boy who marked out unequal squares. We were experts at spreading this thinly across thick slices of delicious bread. Something else to look forward to were visits from my Mum and Dad. Between September and Christmas we just got home for the mid-term at Halloween - a visit was most welcome. Sundays were often boring days, so a visit that involved going out to lunch/dinner meant that we got a "feed" that we talked about for days. My Mum would also bring home cooked food for us - if it was a cake or a tart, we were very popular at table when we shared it out. Possibly strange for boys today to imagine writing a letter home every Sunday, but this is what we did. In first year, our letters were read by Fr Bonaventure to check for "spelling and grammar" before we handed them up for posting. This gross invasion of privacy would not be tolerated today. No doubt this spying worked to concentrate minds on making an effort to write neat letters, but I recall making sure that my letters were mundane and non-critical in case I got myself into trouble. Letters went out in the post on Monday, and like clockwork my Mum would respond and her responding letter would arrive on Wednesday or Thursday - I loved the details of what was happening on the farm at home. Mum has kept many of my (and my brother's) letters to this day - I look forward to getting my hands on them again.